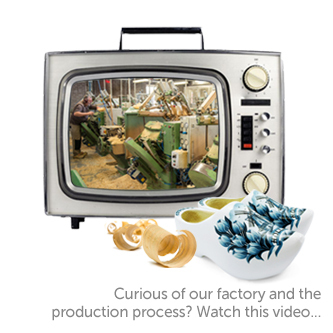 Welcome to Klompenfabriek Nijhuis B.V. Worlds biggest wooden shoe factory! Since 1938 team Nijhuis has been making award-winning wooden shoes in Holland. We use the highest quality Dutch trees and treat them respect. All the creative work from designs of both the products and unique machinery, we do ourselves as well. Full of passion. Our teams love wood, paint and happy designs. Curious for our story? Click here…. You are very welcome in our store at the Grolseweg 3a in Beltrum, te Netherlands. For any questions about our products, please contact us. Our sales team will answer all your questions. E-mail: info@woodenshoes.com or call us: (+31)544 – 35 6060.